First some news.... If you follow me on Instagram, then you already know this, but I am on cloud 9, so I'm going to say it on this blog, too! It's official, I am a FOSTER mommy! Let the real journey begin! 8 months of paperwork, 9 months waiting on the adoption side of things, almost a 2 month transition to the foster care side, and we are official! We haven't gotten a placement, yet, but please be praying it up big time for the little ones that will be coming to us! Could happen any day now, for real!!! You can read more about all this here. And of course, you all know I can't wait to sew some new things for our little beloved babies! 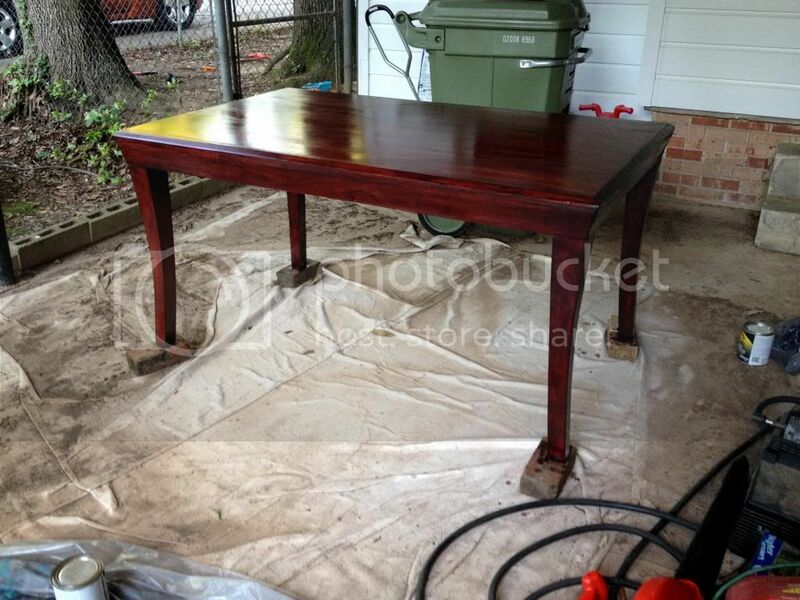 Now, back to business... how about a DIY to a table that I found roadside for FREE? Why do I always forget to take REAL before photos? 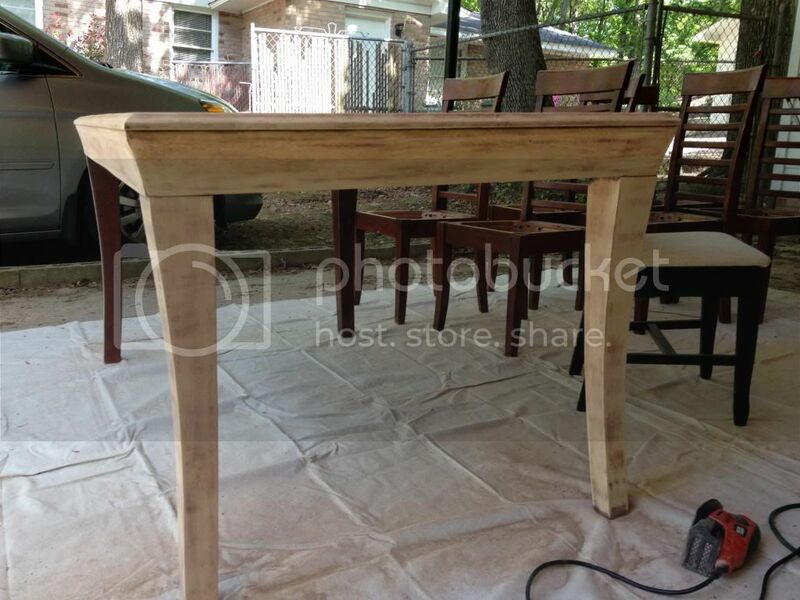 This is the table pretty much sanded down! Yep! 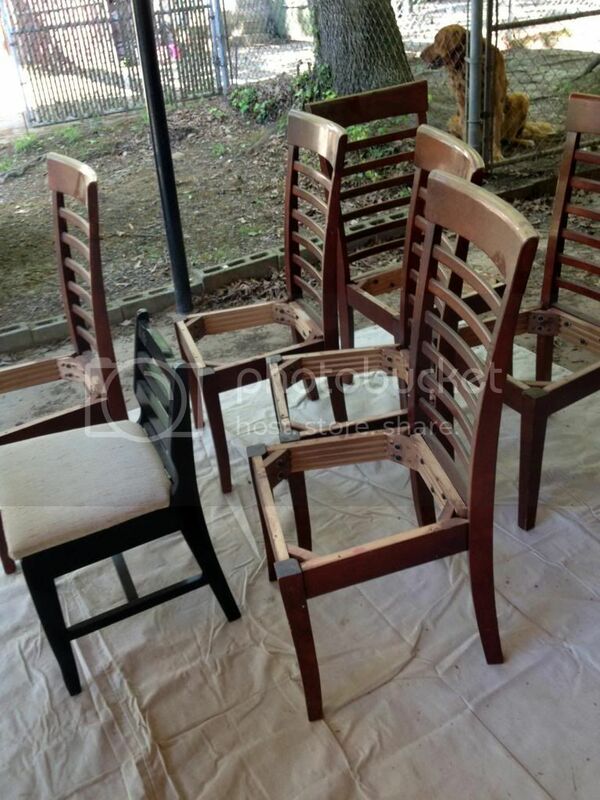 I actually found a dining room table and 6 chairs on the side of the road. My neighbors moved out of the rental house next door and just put a whole pile of furniture on the street. It was in pretty bad shape with lots of scratches and dents, even marker drawn on it, but a little A LOT of TLC later, and we have a beautiful table, which we gave to my brother and his sweet wife as a wedding gift! Honestly, the hardest part of this DIY was the polyurethane. It was SUCH a pain to get right, and I honestly still wasn't completely happy with the results and we tried EVERYTHING, foam rollers, just a brush, foam brushes, sanding, not sanding, humidity, little bugs getting caught in the poly, the works. But we finally got it figured out enough to give as a decent gift! I lost count with how many coats we did, but there were a good many. I love it in her space! Makes it all worth it! This is the second furniture DIY my husband and I have tackled in the last year and he asked me kindly to please refrain from wood projects for awhile. Noway, Jose! The first was our roll top desk. We chose a similar stain to keep things simplified and to which my brother's wife liked. 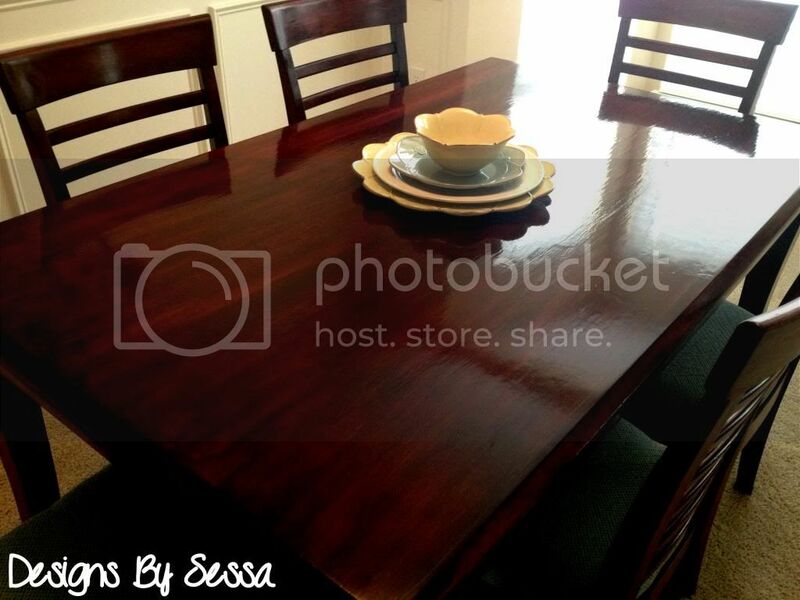 Red Oak Stain by Cabot and their semi-gloss poly. 1 quart of each. 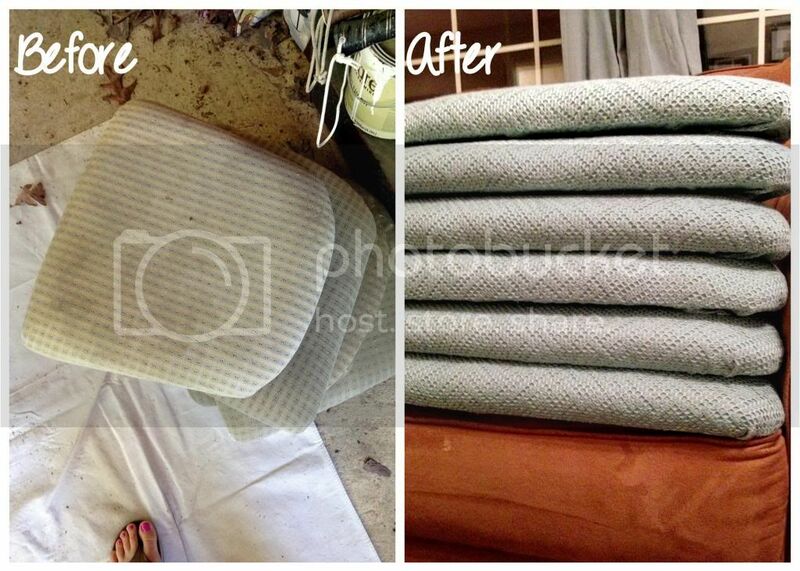 Honestly, the chairs were not in that bad of a shape, but the cushions were NASTY!!! 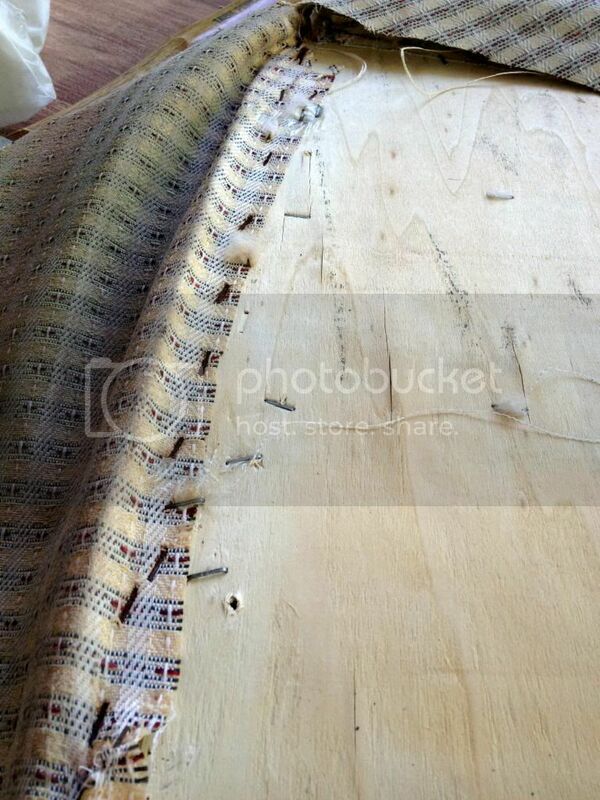 Ripping off all that fabric and recovering was absolutely necessary! Someone was seriously staple happy! Try yanking all those out x 6! 3 coats of stain later, we had a beautiful table! Then was our battle with poly... but, we finally got to a place where we could give it away feeling pretty good about it! I'm so glad to finally be able to give it to them! 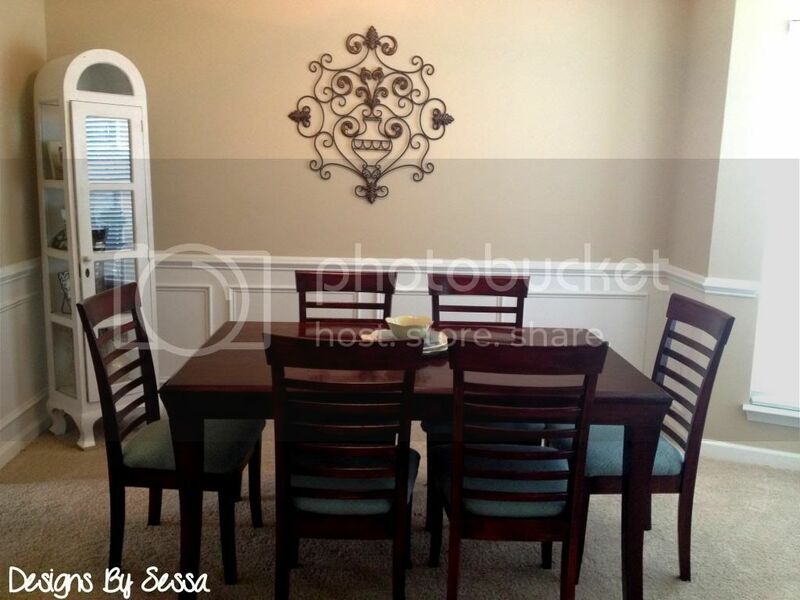 I know fun dinner parties will ensue and lots of memories made here!